Socks can be used during exercise or as a post-workout recovery piece. The amount of compression in a CEP performance sock is 18-25 mmHg which is the measured amount of pressure by millimeters of Mercury. Wearing the socks will improve blood flow and circulation and decrease the amount of energy used during exercise. CEP also uses medical grade compression that is tighter at the ankle, improving vein health by reducing the veins' diameter and pushing blood back to the heart. Socks are recommended for a variety of injuries, as well as for prevention, like Achilles tendonitis, calf cramps, plantar faciitis, and shin splints. 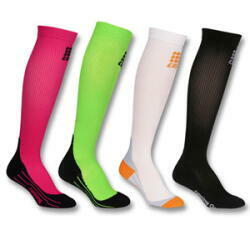 Swiftwick Aspire 12 Compression socks are very similar to CEP, but are manufactured in the USA.